The human body is beautiful. It has the capacity to give and receive love, take us from place to place, to dream, to travel, to create beautiful works of art and music. It is able to do that because of our powerful biological systems. We would like to talk about the digestive system, because the product of our powerful digestive system often shows us clues about our overall well-being. Before we begin, we invite you to take a moment right now to put one hand on the center of your chest and the other on your abdomen. Take three deep breaths. Tell yourself how much you love yourself, and then ask if you believe you deserve to feel your best. Whatever comes up, tell yourself: I am willing to release the patterns in me that created these conditions. I am worth healing. I am worth the time it takes to lean how to nourish myself. I love you, body. Most of us didn’t learn to nourish ourselves well. We learned about food from advertisements, our families, and our friends. We ate what was convenient. Very likely, we were never taught how our bodies worked and what they truly need to feel calm and balanced. One of the most important things you can be aware of when it comes to the thoughts you think and the food you eat is that this is what you are feeding yourself. If you are focused on thoughts that make you feel bad and foods that do not nurture your body, you are denying yourself love and feeding yourself misery. You deserve to feed yourself love and let go of the misery. Misery is not the path to good health or happiness. Bowel movements are a sign of either good health or ailing health, so we would like to show you what healthy bowel movements look like so you can take charge of your own wellness. Health is your Divine right! The fact of the matter is that what goes in, must come out. If you’ve experienced constipation, how do you feel? While constipation may not cause symptoms in some people, it’s not uncommon to have symptoms such as: bloating, pain in the stomach after eating, chronic abdominal pain or cramps, foul-smelling gas, irritability, fatigue or lethargy, brain fog, inability to pass gas, rectal bleeding, changes in appetite or vomiting, or bowel movements that are too hard to pass. The reality is that you live in your body, and you know when you are not feeling comfortable or something doesn’t feel right. We encourage you to trust yourself when it comes to how you feel. Luckily, there are also some signs you can look for if you are not sure what a healthy bowel movement should look like. Take a look at the following lists and chart to learn more. The Bristol Stool Scale was developed as a tool to assess gastrointestinal health. It can be a helpful way to identify how quickly stool is moving through your colon and, therefore, if you are tending toward constipation or diarrhea. The first two stool types would indicate constipation; types 3 and 4 indicate more normal transit time, with type 4 being the easiest stool to pass; and types 5 through 7 leaning more toward diarrhea. While this scale is not definitive proof of your digestive health, it can provide insightful feedback for nutrition and lifestyle choices. Your poop is just one sign of the relative health of your digestive system. How Many Daily Bowel Movements are Normal? Do you ever experience abdominal pain after eating? Chronic constipation is more common than you might think, and about 80 percent of us experience constipation or irregular bowel movements at some time in our lives. What some people or health professionals think of as “normal” when it comes to bowel movements varies widely, from three times per day to three times per week. Surely, we can all agree that these are great guidelines, along with paying attention to your thoughts and doing mirror work! Bowels or poop are an indication of how we live our lives. All of life is: taking life in, assimilating what is good for us, and releasing and letting go of that which we no longer need. When intake, assimilation, and elimination are all in Divine right order in my body, I feel great. There is nothing that feels like a really good poop. Then we flush and it’s on its way, never to return! This is nature’s way. I do not know of anyone who tries to go into the sewer to retrieve their poop. If only we could treat all of our life experiences the same way. Intake, assimilation, elimination, and flush! How often do we dig into the garbage of our past, try to bring back a situation so we can rehash it, go over it again — worry some more — and look for a different solution, when it no longer exists in our life? When I find myself doing this, I say to myself, “Flush, Louise!” and I bring myself back to the now. Now is where the action is. Good digestion starts with how you digest life. When you are afraid of life or don’t trust it, you tend to focus on things that reinforce that belief. Remember, it’s only a thought, and a thought can be changed! We have created a list of tips that you can follow to be kind to yourself, love yourself more, and learn to feel safe. Pick one thing that feels good to you from the list below and practice it each day. Tip 1: Are You Feeding Yourself Good Thoughts? Continue your mirror work and affirmations. Tip 2: Love Your Beautiful Body! Tip 3: When Was the Last Time You Had a Hug? Hug yourself. Feel your heart well up with love for this body that takes you from place to place. It loves you and needs to feel appreciated or it tends to get sick. When you look in the mirror, as you walk around during the day, as you exercise, or anytime you think of your body. Tell your body how grateful you are for how it supports you, how strong your legs are as they carry you from place to place. Pick something to appreciate, and tell your body how much you love it. When you sit down to a meal, turn off the TV and stay away from your phone and computer. Sit in a quiet place, and focus only on your food and the sensory experience you are having. Give love to the food and your body as you eat. Truly enjoy your food! If you’re stressed, take time to breathe deeply and relax before eating, so that your body calms down and can digest your food. High protein, high fiber and high in antioxidants, this healthy and tasty dessert is sure to satiate your sweet tooth! Serve with Cinnamon Orange Coconut Butter for a sweet, anti-inflammatory, antihistamine, anti-viral treat! Fill your environment with things that connect you with the feeling of love. Write affirmations and post them on your computer, on the refrigerator, on your bathroom mirror, or in your car. Have keepsakes that you love in places where you want to be reminded to be kind to yourself. Instead of choosing the harder approach, ask yourself how you can make things easier on yourself. Make it a game to find out how you can keep things simple and easy. Remember, there’s no need to suffer! Choose to stop engaging with media that is violent or reinforces negative thoughts. Turn off the news, stop reading women’s magazines that focus on weight and perfection, and choose movies and TV shows that make you feel uplifted. Throughout your day, ask what you’re feeding yourself. If you notice that you’re feeding yourself misery, shift into feeding yourself love with nourishing foods and positive, loving thoughts. Spend more time with friends who support you in making loving changes in your life, and spend less time with friends who are not supportive of your new habits. If you are afraid of something, repeat: All is well. Everything is working out for my highest good. Out of this situation, only good will come. I am safe. Say this as often as you need to in order to feel more comfortable and safe. Keep in mind that you are responsible only for yourself. Some people take responsibility for the stress, health conditions, and upset emotions experienced by their spouse, kids, extended family, friends, clients, co-workers, and anyone they care about. If you take in the stress and upset from others, it can have a negative effect on your own stress levels and health. You are essentially taking responsibility for their stress. Practice loving them instead of taking on their stress and burdens. You can do this by sending them a loving affirmation, such as, I lovingly release this energy. They are free and I am free. All is well in my heart now. Allow yourself to release the energetic stress and trust that the energy of love is the most healing of all. If you are feeling stressed or upset, notice whether you’re pushing to accomplish something. Move from pushing to allowing. Ask Life to help you make it happen, and focus on allowing it to be easy. Keep a gratitude journal. Since what you focus on expands, write down all of the wonderful things that happened in your day, as well as the things you are grateful for. Remember, one can have gratitude for seemingly small things, too, like a cat purring, a dog wagging its tail, a child’s smile, clean bedsheets, the healthy meal you had, a good book, and so on. You get to choose what you focus on, and gratitude is a very healing emotion that is so good for your body. If you turn these activities into your habits each day, you can capture all the proof that Life loves you, which can help eliminate doubt and can help you give and receive from Life fully. When you know that life loves you, your body knows it! 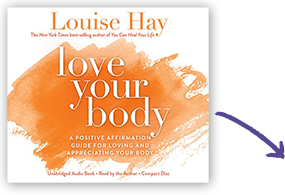 For meditations, recipes and more information on how your digestion is connected to your overall health, you will like Louise’s book, Loving Yourself to Great Health: Thoughts and Food — The Ultimate Diet, written by Louise Hay and health experts, Heather Dane and Ahlea Khadro. Available in hardcover, paperback, and as a companion audiobook with meditations. The growing “epidemic” of stress, lifestyle diseases, and autoimmune diseases has no root cause according to mainstream medicine, yet that root cause seems simple to us: it’s really an epidemic of not loving the self.